The memorial consists of bronze plaques attached to a low lectern top structure made of red brick. The structure is approximately two feet wide by three feet long and two feet high. The slanted top holds a large 20” by 36” plaque. Attached to the front are two smaller 10” by 14” plaques. The memorial is in the War Memorial Park at the Robeson County Public Library in line with eight other war memorials placed since 2008. The memorial was relocated for construction of the current Robeson County Public Library building dedicated in January 1969 and is much less impressive than as originally constructed in 1928. The original featured three columns of concrete and brick connected by a low wall. The two end columns carried globed lights and the taller center column was capped. The larger bronze plaque was attached to the center column. The “1917” plaque was attached to the left column and the “1918” plaque attached to the right. A newspaper photo shows it was painted a light color, most likely white. Over 2,000 people attended the dedication ceremony two days before Christmas 1928. Miss Janie Carlyle, president of the Lumberton American Legion Auxiliary dedicated the memorial and presented to Governor A. W. McLean, a Lumberton native, who accepted it on behalf of Robeson County. The ceremony included, prayers, music and recitation of the poems “In Flanders Fields” and “America’s Response.” A large number of Gold Star Mothers whose sons had died in the war were present for the dedication. 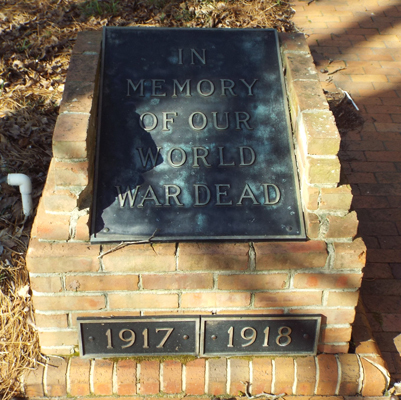 The memorial is located in the War Memorial Park at the Robeson County Library, 101 N Chestnut St, Lumberton, NC. The memorial park (often referred to as a garden) can be accessed from inside the library or through a gated walkway that runs next to the library on East 2nd Street. Public access is only available when the library is open. 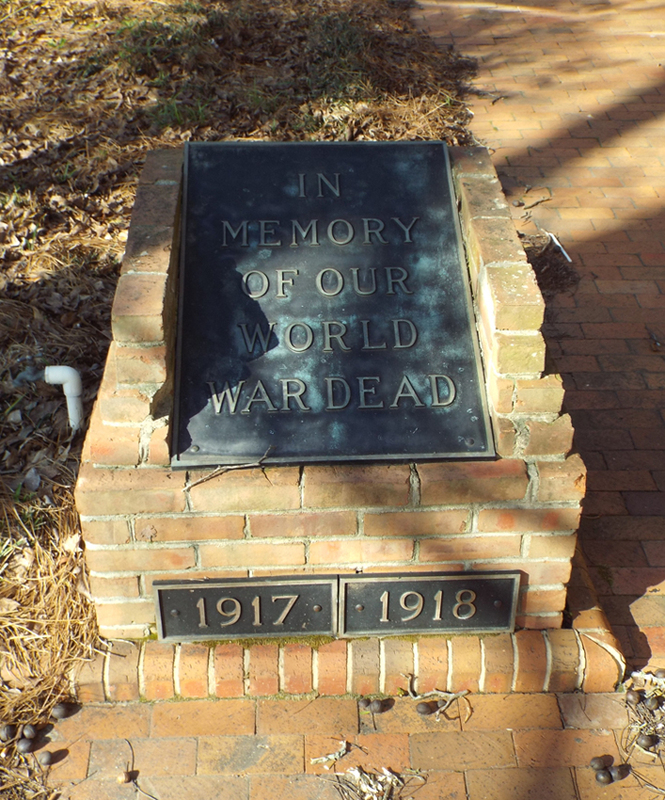 War Memorial Park is adjacent to the Robeson County Library. There are eight other war memorials in a line with the World War Dead marker. Across the park from the markers is a sundial sculpture. The park is small, covering less than one half of a city block. It has a mix of mature trees and shrubbery and much of its area is covered by brick or concrete pavers. The park is surrounded by an iron fence. Most of the city block now occupied by the Robeson County Library, its parking lot and the War Memorial Park were carved out of the American Legion Park that had been dedicated to the memory of World War Veterans in 1926. The WWI memorial when constructed stood at the northeast corner of the Legion park at the intersection of Chestnut and Second streets. The memorial was torn down for construction of the current library building dedicated in 1969. A news article indicated the plaques may first have been attached to the outside walls of the new library. It is not certain when the plaques were moved inside the garden.